Glenwood North is a beautiful neighborhood of townhomes that sits convenient to Crabtree Valley Mall and Brier Creek Shopping areas. It is located off of Glenwood Avenue and is a five minute to either 440 or 540 giving you easy access to anywhere in the Triangle. It is common to see neighbors out walking their dog or just out for a stroll in the neighborhood. You can not find a better location in Raleigh, NC that allows you to be far enough from the main hustle and bustle of Downtown Raleigh but close enough to commute to work there in under 10-15 minutes travel time. Looking to buy a townhome in Glenwood North? Interested in finding Townhomes for sale in Glenwood North Subdivision? Click that link to find all the currently available homes (if there are any available) in this townhome community located in North Raleigh. Our for sale information is a direct feed from the Triangle MLS that is updated multiple times per day so it is always accurate. The homes you would expect to find for sale in the Glenwood North Townhome Community of Raleigh, NC 27612 are generally going to range between 1300 and 2400 square feet. Most of the homes were originally built by Standard Pacific Homes from 2005-2007. The last set of homes were built in this community in 2010. There are three basic series that include Townhomes with a Garage price range is typically $200,000-$280,00, Townhomes with a Basement price range $180,000-220,000 and a 2 Bedroom Townhome without Basement or Garage that start from the mid $150’s. The smallest homes in the neighborhood start with a 2 bedrooms floor plan while the larger floor plans have a four bedroom layout. Many of the lots offer a wooded view out the back as you can see in this aerial view of the neighborhood. What’s Going on Nearby the Glenwood North Townhome Neighborhood? Glenwood North Community is located off of Glenwood Avenue/Highway 70 which is a main artery from Downtown Raleigh,NC to the Airport and then to Durham, NC. You will find that your shopping choices are plentiful, every type of store you can imagine is within 2-5 miles of Glenwood North Townhomes due to it’s Glenwood Rd connection to both Crabtree Valley Mall and Brier Creek Commons Shopping Area. Both of these trendy shopping centers continue to grow and add new stores each year. Crabtree Valley Mall has Macy’s, Belk and Sears as its anchor stores. In the evenings you will want to take a ride over to Crabtree Valley Mall and enjoy dinner at one of the fantastic Restaurants in Crabtee Valley Mall where you will find everything from the very popular Brio , one of my personal favorites is the Cheescake Factory and every type of cuisine you can imagine. Want to catch a Movie? The Regal Brier Creek Stadium 14 is a popular place to see the latest movie release and it’s not uncommon to have new releases sold out the first few days. There is an Urgent Care Center just 2.5 miles from the neighborhood and your closest hospital is Rex Hospital on Lake Boone Trail. Find out about everything that is nearby to Glenwood North Townhomes including places of worship, banking, shopping, Attractions and recreation and much more on my website on the Market Insider Community Info Page. 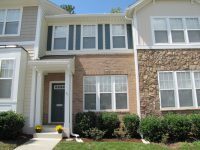 When you buy a townhome for sale in the Glenwood North Community of Raleigh, NC 27612 the local schools serving this area are inside the Wake County Schools system. To get local school scores and more information and parent reviews, visit my website Community Insider page and click on Schools. 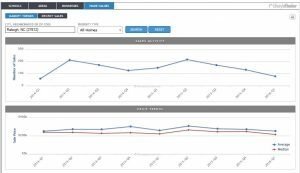 How do Property Values in Glenwood North stack up? Homes in the Glenwood North Subdivision have seen a steady increase in value as the surrounding market increases. You can see all the details on the 27612 Market Insider Page.